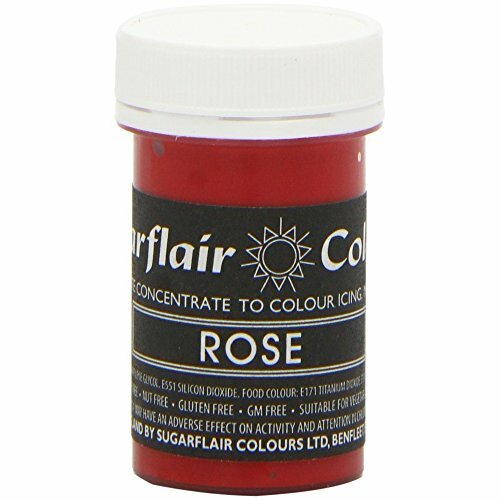 50 x Sugarflair ROSE Red Pink Pastel Edible Food Colour Paste for Cake Icing 25g by Sugarflair at Your Daily Food Choices. MPN: SFPASTEL_20x50. Hurry! Limited time offer. Offer valid only while supplies last. Sugarflair Edible Concentrated PASTEL Colouring Pastes are perfect for colouring icings and pastes. Use a small dab on the end of a cocktail stick. Sugarflair Edible Concentrated PASTEL Colouring Pastes are perfect for colouring icings and pastes. Use a small dab on the end of a cocktail stick. These pastes can be used for intense colour so use sparingly to start with! Each jar contains 25g of paste, which is very generous considering so little colouring is needed. This means the product will last many baking and decorating sessions. The colour is applied to your paste and is very easy to work with. Colours are so concentrated they colour without making the paste or icing sticky or lumpy. The colours are perfect for all types of paste including, sugarpaste, modiling clay, play dough, mexican paste, buttercream, marzipan, flower & modeling paste, pastry and more. This product is also perfect for painting onto sugarcraft, just add water or rejuvenator spirit. It should be used sparingly as it is a highly concentrated product.Sugarflair Edible Pastel paste colours are completely nut-free, gluten free, GM-free, fat-free and suitable for suitable for vegetarian, Halal and kosher diets. Nett 25g Pot.